East Blvd and Scott Ave.
One of the women had a cow bell, which set off a round of boisterous “MOOOOOing” on our side of the street. I don’t think she particularly cared for that. 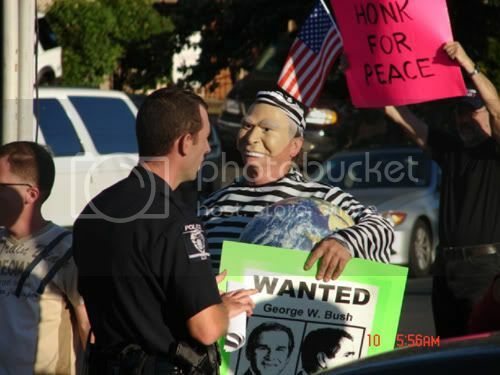 Then some mOOnbat freak showed up in a striped jailbird costume, wearing a Bush mask and carrying a globe and a sign that said something about Bush being a war criminal. Around that time, the police arrived. We’re actually getting kind of friendly with him, he’s a really super guy. He told us, though, that some of our hand-held flag poles were too long, but he let all the flags spiked into the ground stay. 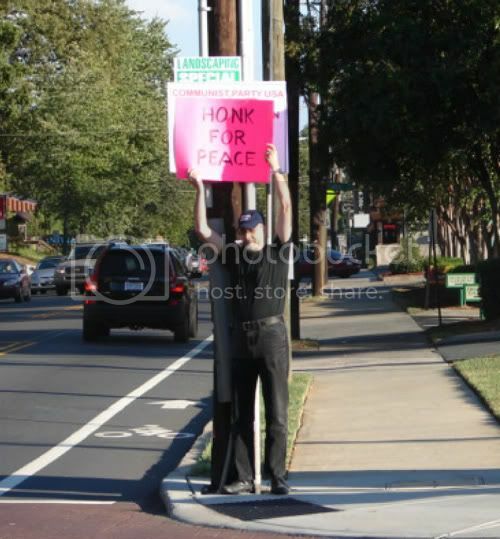 And he told us that the mOOnbats had complained about the sign we placed over on their side. 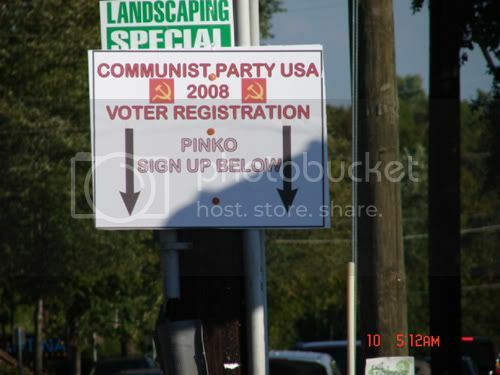 Seems they were too afraid to take it down themselves (darn! talk about a photo-op), so he took it down for them. He brought it back over to us and we feigned innocence and he just smiled. So, your 8 Eagles not only held off but absolutely flustered about a dozen CodePINK moonbats. Debbie, our scout, reported about 5-6 at their second location, so they’ve split again. Upon hearing that, their numbers at the East Blvd location made perfect sense. Consequently, their number of “bait” cars that ride in a circle honking was significantly reduced also. With that said, I’m declaring VICTORY IN CHARLOTTE once again! Highlites of the evening’s event. 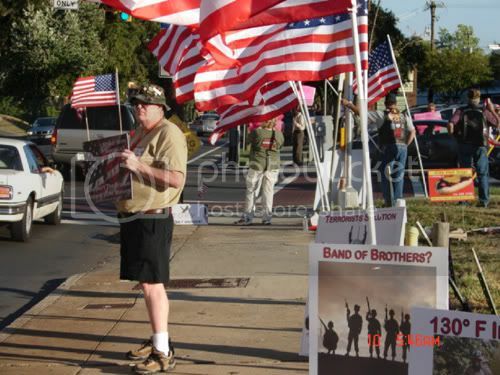 Begin with a group of people displaying a multitude of American flags, and patriotic signs. Can you guess which side this is? Eagles arrived early and put up a sign for the benefit of motorists that might not know who was who. Moonbat try to hide sign. 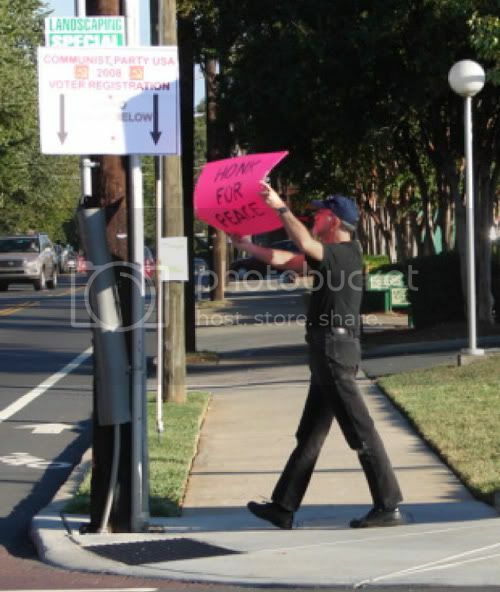 Moonbat only enhances message of sign. Moonbats love to dress up, dont they? October 10th, 2007 under Uncategorized.